The rate at which a plant photosynthesises is determined by 2 factors, the plants metabolism and the amount of light available. Plants need 3 components in order to live, these are Light, Nutrients and Carbon Dioxide, light is the determining factor, the more light you add, the more nutrients and Carbon dioxide the plant will require in order to survive. Pressurised CO2 consists of a pressurized cylinder filled with Carbon Dioxide, the most common cylinders used are those from fire extinguishers, as they're cheap and easily refillable, the other parts you need include: Regulator, Solenoid, Brass Check Valve, Bubble Counter, Diffuser, CO2 line (Air line is not suitable as it is semi-permeable and will leak under high pressure), Drop Checker, 4DKH water and Bromothymol blue acid based indicator. I will be writing a guide in the future on how to set up a DIY pressurized unit using a fire extinguisher. Another popular way of utilizing pressurized CO2 is to buy a kit, JBL make them as do ADA and a few other companies that specialise in planted aquaria, they work in exactly the same way as the DIY extinguishers, the only draw back is that they're quite expensive and the canisters are generally disposable. Another popular way of injecting CO2 is to use a fermentation reactor, it consists of a small bottle that contains a yeast culture and a food supply of sugar, as the yeast respire they produce Carbon Dioxide, this increases the pressure within the vessel and it then exits and is diffused via a diffuser in the same way that cylinder based CO2 is. Yeast based CO2 is only really suitable for smaller tanks, using it on larger tanks is just unrealistic if you're trying to achieve the desired 30Mg/L of CO2. The reason it works is I have formulated my mixture so that it has a peak CO2 output for a week, before it begins to drop off and needs replacing. The unit gives me 30Mg/L when it is on, I disconnect the unit at night, the reactor vessel is heated in a water bath that keeps it at a constant temperature of 30oC in order to avoid fluctuations. Aerosol CO2 cylinders generally consist of an aerosol canister filled with CO2, it has a small button on the top that dispenses a set quantity of CO2 gas (The CO2 in the bottle is a liquid due to the high pressure but it vaporizes when it is reduced to air pressure), this gas then generally enters a bell shaped diffuser via a small CO2 line, it is then left to diffuse on its own, this method is terrible in my opinion, CO2 diffusion is poor and you're merely wasting money if you use it. If you're unaware of the principle of electrolysis, basically a current is passed through a material and its constituent molecules are broken down into ions, these ions have a charge either positive or negative, they then travel to either the anode or cathode dependent on their charge. These systems have a large block, when a current is passed through them they produce CO2 as a product of electrolysis, again, not a fantastic method and I have never seen anyone use one, so I'd avoid them. There is another alternative to CO2 which is popular amongst those that don't wish to use pressurised CO2, products such as Easy Life Easy Carbo and Seachem Flourish Excel are commonly referred to as liquid carbon, they're actually comprised of a chemical called poly glutaraldehyde, a nasty chemical that is carcinogenic so don't inhale, ingest or get it on your skin. It irritates the lungs and if ingested could kill you. It is commonly used in hospitals as a disinfectant and in the treatment of warts and verrucas. It kills all cells as it cross links proteins so be very careful with it. It has algaecidal properties which is why it is popular also, but NEVER should you over dose it, it will be detrimental to your aquatic fauna, and sensitive organisms such as Shrimp and vascular plants may die as a result. When dosed normally however it is totally safe. It should be worth noting that it is not as good as real CO2, so you wont be able to achieve as much with it as you would if you were using real CO2. 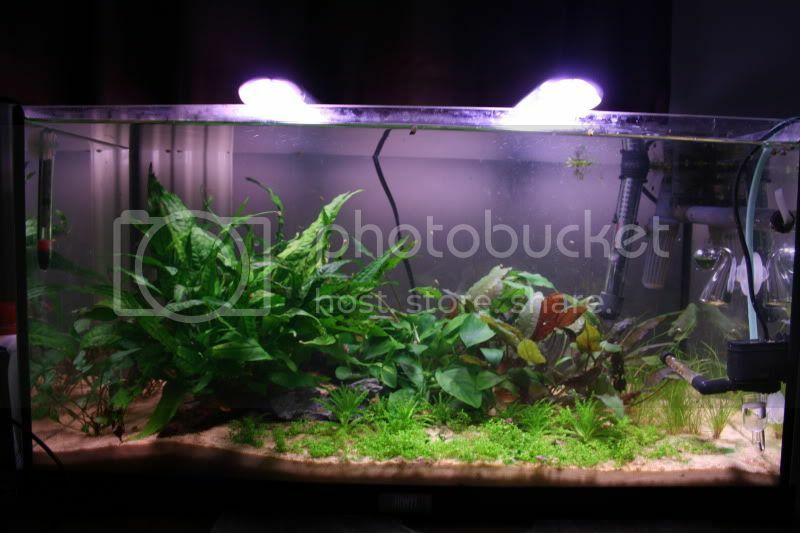 CO2 or Liquid Carbon should be added when the light over your tank is so intense that ambient CO2 is no longer sufficient, yellowed leaves on plants generally indicate a nutrient deficiency, and if you have high-light and your nutrients are on par then you can pretty much guarantee that it is a CO2 deficiency. There is a very vague guide as to whether you need CO2 or not and that is if you go over 2 Watts Per Gallon then you'll generally require it, this guide was based on T12's however and the most popular choices of lighting at the moment are T5's, T6's, T8's and Compact fluorescents, as you are probably aware these emit a lot more light than their T12 counter parts, which is why the WPG rule doesn't really work any more. There are also some plants that will just not grow without CO2, and example would be Hemianthus callitrichoides. Remember however that when you're dosing CO2, water circulation is very important in the prevention of algae and continued health of plants, it helps distribute CO2 as well as other nutrients and remove metabolic waste from plants, aim for about 10-15x the aquarium volume per hour, your filter can count towards this though, but halve the stated value if you're not using an Eheim filter. To boost flow you can add circulation pumps, I use and recommend Hydor Koralia's, they're very good pumps as the flow is not concentrated it is even. I hope this article is of benefit to others. Another helpful and informative piece, Jack. Thanks for taking the trouble. I want to plant a tree in the water so beautiful.